stunning.stunning.stunning. you outdid yourself, again. Were these guys ahead of our time? your blog constantly astonishes me. Smutna by Ferlinghetti - I bet he wd dig that. Interesting but some of these books are czech ones. Some of these remind me of Alvin Lustig or Paul Rand. Just gorgeous! Thanks so much for posting. Nothing profound to add... just the same gushing as everybody else :) Great stuff-- thanks for sharing. Brilliant. I love the icy stare of Sherlock Holmes. Classic! Are you kidding me? These are ridiculous- transcendental. Illustration by Ferlinghetti? Well, rather obviously, no. The author's name is Frantisek Kudlac. See this: http://www.e-antikvariat.com/english/article.php?category=32. Istvan, in that caption I was just expressing delight that there was an edition of Ferlinghetti. I also realize my captions can be read two ways, but for most of these books I'm only naming the writer, not the illustrator/cover designer. 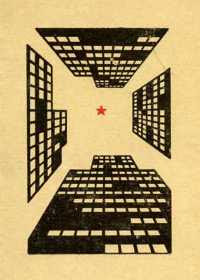 Except for some I give both names, like: "cover illustration by Igor Kostka for Kmotor na čerešni by Štefan Sabo." Sorry for this confusion. And thanks everything for your comments!